Instant Pot BBQ Chicken is zesty and sweet, easily and quickly made in a pressure cooker. Pressure Cooker Zesty BBQ Chicken is perfect for weeknight meals. 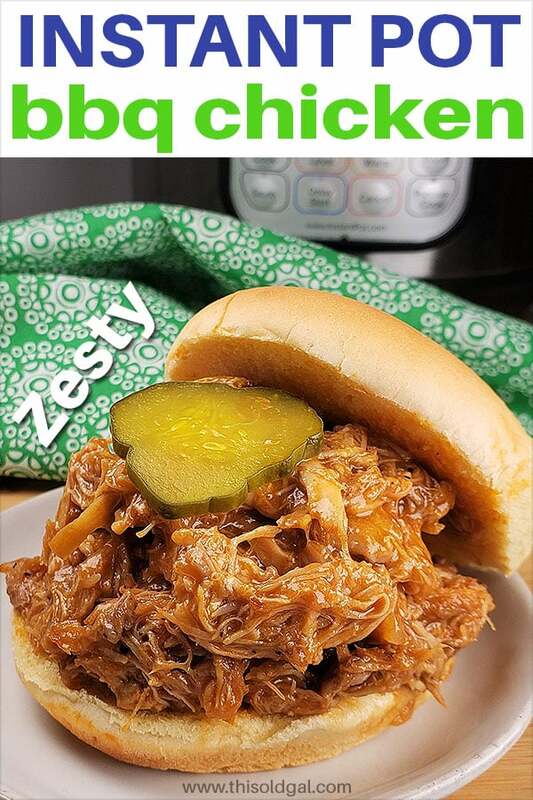 With minimal ingredients, Instant Pot Zesty BBQ Pulled Chicken makes a great meal in your Instant Pot, Mealthy MultiPot or Pressure Cooker any night of the week, without any preparation or thought.We will be adding more “dump and push style” pulled chicken recipes, which are found in our Instant Pot Pulled Chicken Collection. Can I use Frozen Chicken for Instant Pot BBQ Chicken? Yes, you can, but it does not come out as well. If you do use frozen chicken, please reduce the cook time by one minute. The Instant Pot, Mealthy MultiPot or Pressure Cooker will take longer to come to pressure and therefore, you do not need to add time. Special Ingredients Needed for Instant Pot BBQ Chicken. Sweet Baby Ray’s Barbecue Sauce –Sweet Baby Ray’s is good and quite sweet. Stubb’s Mesquite BBQ Sauce is terrific and not quite as sweet. How to Make Instant Pot Barbecue Pulled Chicken. 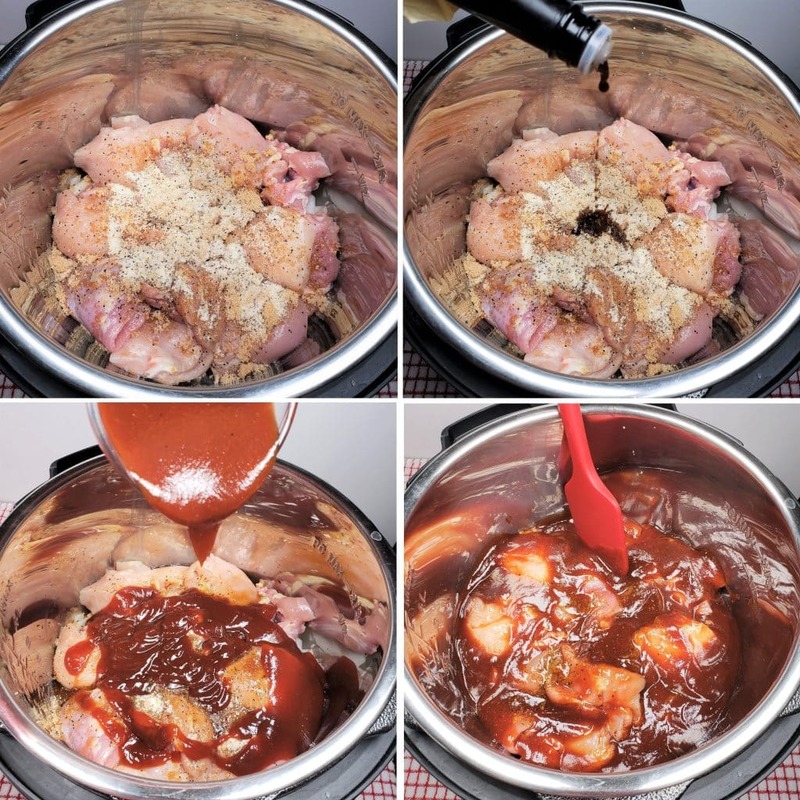 Instant Pot BBQ Chicken is simple to make using an Instant Pot, Mealthy MultiPot or Pressure Cooker. Use a good knife to dice up the onions and trim and cut the chicken. Diced onions, chicken, seasonings and sauce are added. The chicken cooks up quickly and is then shredded. Can I use Only Chicken Thighs? 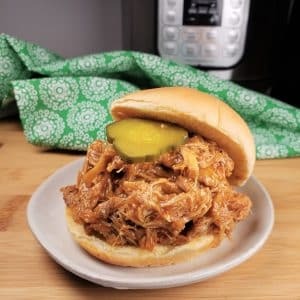 Yes, you can and you will have a much juicier Instant Pot BBQ pulled chicken sandwich. Dark meat is juicer and much more forgiving when cooking in the Instant Pot, Mealthy MultiPot or Pressure Cooker. Can I Use Only Chicken Breasts for Instant Pot BBQ Chicken? Yes, of course, however, the Instant Pot BBQ won’t be as juicy as when using both dark and white meat chicken. As white meat chicken has less fat than dark meat chicken, it needs less of a cook time and a bit of water. For white meat chicken, the cook time is only 3 minutes. How Do I Prevent Burn Notice Using BBQ Sauce in Instant Pot BBQ Chicken? The chicken will give off plenty of liquid, so that the Instant Pot, Mealthy MultiPot or Pressure Cooker can come up to pressure. The onions on the bottom will release water, which turns into steam. The onions are the first ingredient added to the Instant Pot, Mealthy MultiPot or Pressure Cooker, so that there is a slight buffer on the bottom of the pot. The barbecue sauce is spread over the chicken with a spatula to keep it on top. 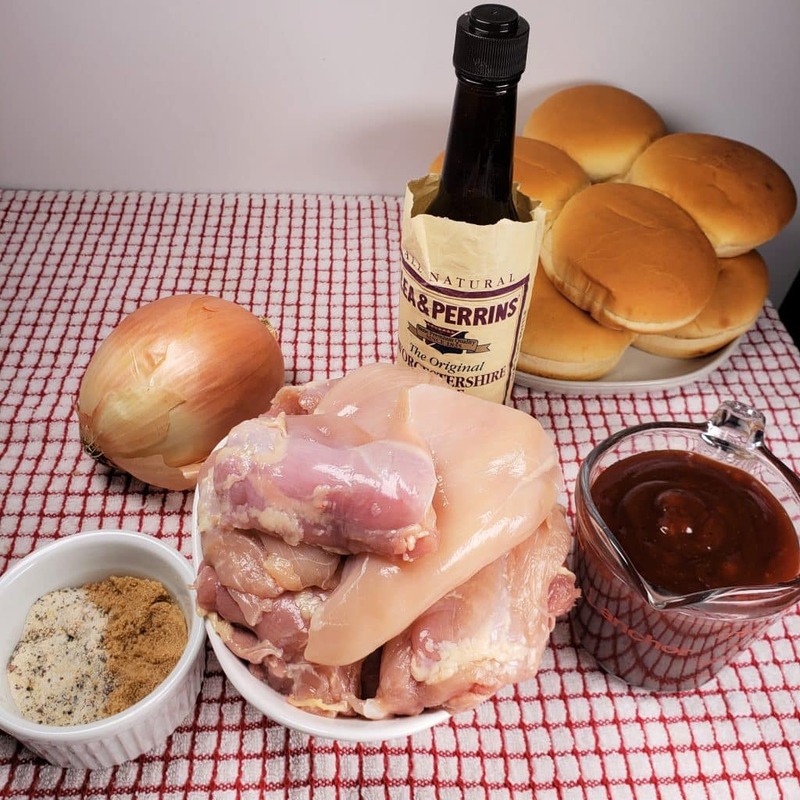 Once the cooking pot begins to heat up and water is released, the barbecue sauce will mix with the liquid and the chicken. How to Shred Instant Pot BBQ Chicken. An electric hand held mixer is the best and easiest way to shred chicken. You will need some type of splatter guard, so that barbecue sauce doesn’t shoot out all over the place and make a mess. Check my Instant Pot Shredded Buffalo Chicken recipe to see a video of shredding chicken with an electric mixer. Alternatively, pulled pork claws or two forks work; it just takes longer. Tips and Tricks for Instant Pot BBQ Chicken. Add the diced onions to the pot first, to act as a buffer from the barbecue sauce and help the pot come to pressure. Use a combination of dark and white meat chicken for a perfect balance of flavor and juiciness. White meat chicken is dryer and leaner than dark meat chicken. The sauce will sink into the chicken, so there is no need to simmer after pressure cooking. Use an electric hand held mixer to shred the chicken. More Instant Pot BBQ Sandwiches to Love. There are at least six more pulled chicken recipes coming up. If you have an idea for another pulled chicken sandwich, let me know in the comments below and I will try to accommodate your request. KitchenAid Hand Mixer – for baking and shredding chicken! Add onions and chicken halves to pressure cooker cooking pot. Sprinkle on zesty Italian dressing, ground mustard. Pour in Worcestershire Sauce and Barbecue Sauce. Lightly mix the sauce to cover the top of chicken. Lock on lid and close pressure valve. Cook at high pressure for 4 minutes. When beep sounds, wait 5 minutes and then carefully release the rest of the pressure. Use an electric hand held mixer, pulled meat claws or two forks and shred the chicken. The liquid will absorb into the chicken as it is being shredded. 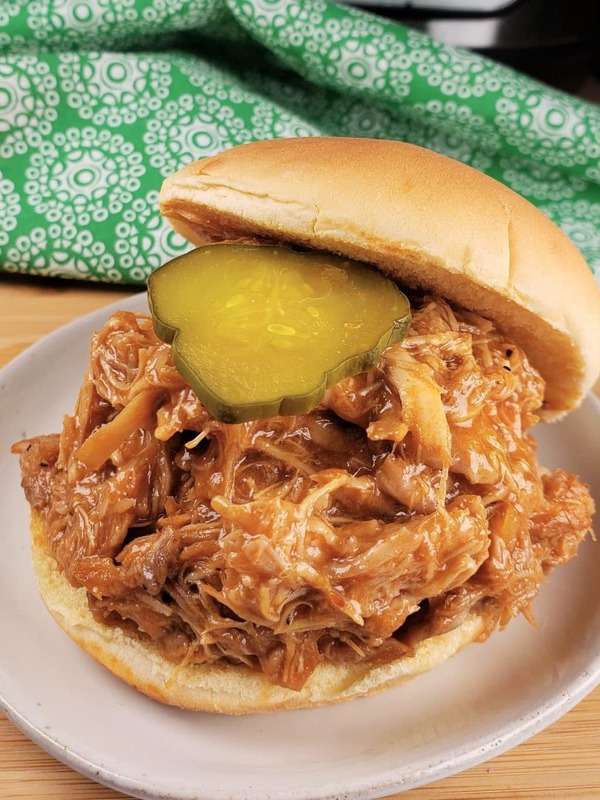 Pile Instant Pot Zesty BBQ Chicken onto hamburger buns and top with slices of dill pickles. What To Serve with Instant Pot BBQ Chicken. I’ve made this twice now. Really great flavor! Only issue was I followed the recipe to a t (onions on bottom and everything) and I did get the burn notice. Adding a cup of water made it go away and the sauce was still perfect. Love this recipe so much. It was quick and easy and one of the best sandwiches I ever had. Thank you. I’m using 3 1/2 lbs of chicken in a 8 qt IP. Do I add a bit more cook time to this? Smells really good, but it took forever to start pressure cooking because I kept getting the burn notice. I layered onions then chicken then spices then sauce. I got the burn notice several times. Finally I turned off the pressure cooker, opened the lid and added some water (less than a cup and stirred everything up.